Are you a fan of comfortable living? Well then a multi location dimmer is a device you should definitely have. Multi-location dimmer switch is a switch that can be used with companion switches to control light fixtures from multiple locations. 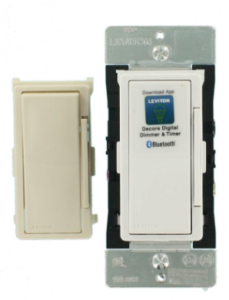 The Leviton multi location Decora Digital In-Wall Dimmer is a reliable smart switch that provides remote on-off, dimming, and scheduling, similar to its competition. 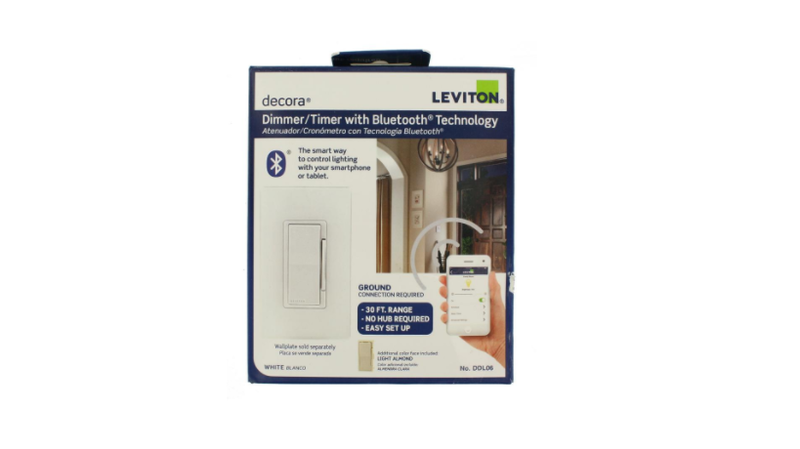 Just tap on your smartphone or tablet and the Decora Digital Dimmer & Timer app to control, adjust and time lighting for daily activities or to ensure a “lived-in” look in your home while away. 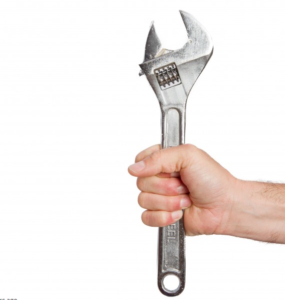 How difficult is the dimmer installation? It comes with easy readable instructions. 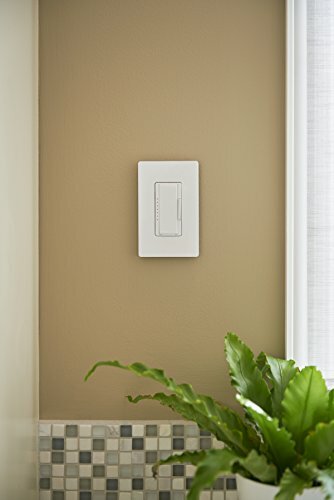 It is just slightly different than a normal light switch, as it needs constant power to run the Bluetooth and it does require a ground connection. Remember to check the settings on your phone or pad. On your phone go to >Settings > Applications (Or Application manager) > Decora Digital > Permissions > Location (Turn to ENABLE or TURN ON). 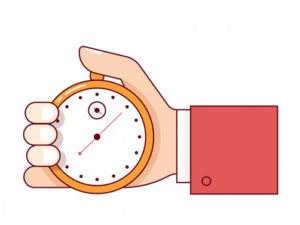 If you don`t do this the device will not operate like promised. 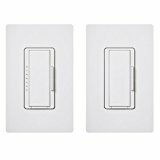 It does not come with a wall plate but has 2 different colors of face plates – white and light almond. 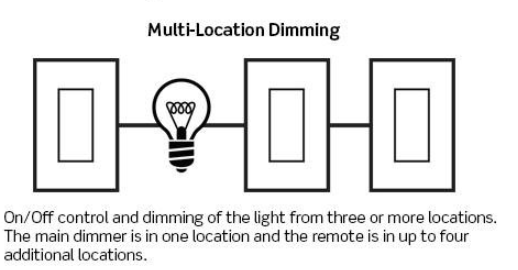 Do you want to use multi-location dimming? 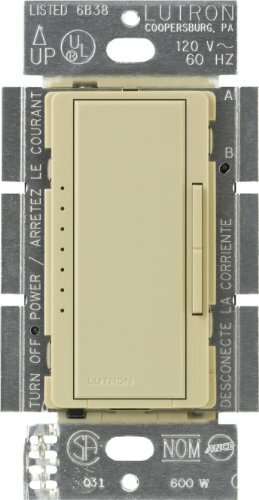 A Decora Digital remote must be used with the Decora Digital Dimmer or Switch in a 3-way or multi-location application. Your internet connection is down and you can`t adjust the lights, it can be a little annoying…but with this device you don`t have that problem, because it uses bluetooth to control the dimmer. 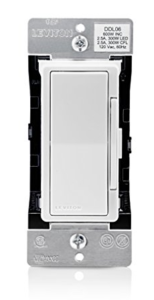 •The Maestro Digital Dimmer from Lutron allows you to dim a light fixture from multiple locations – up to ten locations. How to dim from multiple locations? 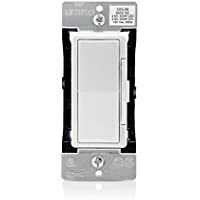 If you want to dim a light from one switch location, you just simply install your dimmer, but if you want to dim your light from more than one switch location, you just pair the dimmer switch with a accessory dimmer or a companion dimmer (manufactures uses different names for these “extra” dimmers). If you are using Maestro Dimmers and Accessory Dimmers, you can control a single light from up to 10 locations – it`s very comfortable for say controlling the lights at either end of the staircase or maybe at both entrances to a room. 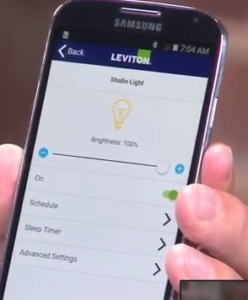 If you are a fan of customizable settings and like to play around with those, then this dimmer has some interesting features. Let`s go over some of them. The fade on can be used in a room where you like the lights to come on slowly allowing your eyes to adjust to the change in light. For example maybe you want the bathroom lights to come on slowly, but fade off fast. But then for the dining room or kitchen, you like the lights to snap on fast maybe in 2 to 3 seconds, but fade off slowly, about 5-10 seconds. The digital adjustment lever allows you to adjust the low-end of the dimming range based on the capability of your bulbs. Some of your LEDs and CFL bulbs will require a higher Low-End Trim than others. This trim will take care of the flickering and strobing when the dimmer is turned on to its lowest possible setting. 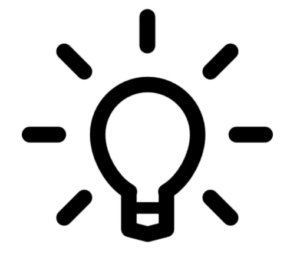 You can use this feature as a personal preference for halogen or incandescent bulbs. The high end trim allows you to change the highest achievable light levels. Disabling “nightlight mode” is an energy saving practice and also allows the dimmer to be compatible with a broader range of CFLs and LEDs. Enabling “nightlight mode” provides a soft glow for easy location of the dimmer in a dark room. 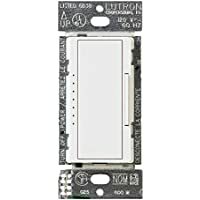 Lutron has not included the advanced programming guide in the blister pack, but you can find it easily on the lutron website by googling it. It`s in a pdf file and I would suggest you print it for future reference. Be aware that if you install this with an existing 3-way switch, you have to re-program the dimmer to get it to work properly. It is pointed out in the fine print at the end of the installation instructions. This device is also available in a cl digital dimmer multi location kit. 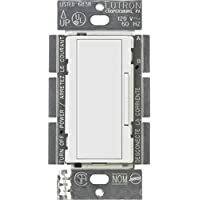 Can this lutron companion switch be used without a master? No, you must have a master switch/dimmer like Lutron MACL above. 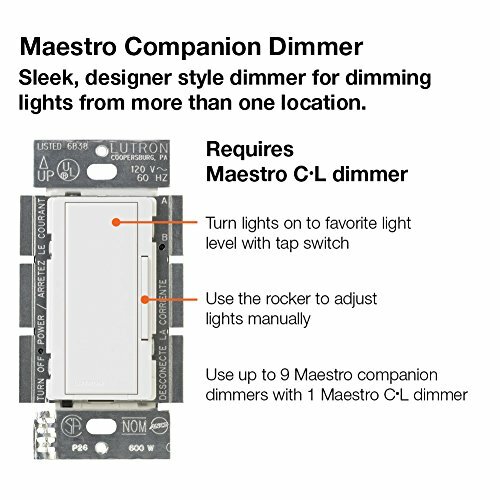 This Maestro companion dimmer switch is designed to compliment a Maestro multi-location dimmer like the Lutron MACL above this. You can link up to 9 companion switches to a Maestro or Maestro wireless switch, for a total of 10 spaces of control. This dimmer has a tap switch that turns your lights on-off and a rocker that dims and brightens lights to suit any activity. 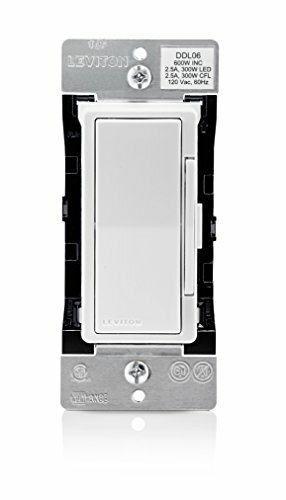 This switch works the same way as the lutron macl dimmer – you tap once to brighten lights to preset level and if you tap it once more you get full brightness. Lights fade down and up smoothly, gives your eyes time to adjust. The coordinating wallplate is sold separately. Will this work with LED bulbs? Yes, as long as the master switch is compatible with dimmable led bulbs. 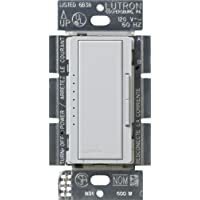 You can use this Lutron MA-600 dimmer switch with incandescent and halogen bulbs. 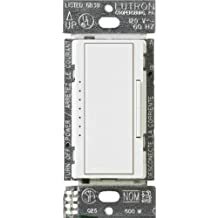 If you are looking for a dimmer to use with LEDs take a look at the dimmers above. You can have full range dimming of your light from up to 10 locations if you use companion dimmers with this dimmer. Please share this page - Thank You!